Are you ready to edit your own images and turn them into a masterpiece? 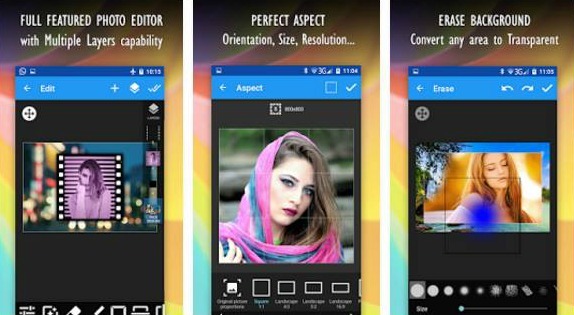 We present to you one of the finest Android apps in the Photography category that allows any user to make image editing and turn it into a fantastic and stylish masterpiece, called Multi Layer. Created by WandApps, this cool image editing app is simple to use and full of unique features and friendly user interface. Multi Layer includes dozens of high-quality editing features for your images. Select and add any of the effects, stickers, frames you like and give your images a great improvement. Forget about other image editing apps, this one has an option for you to add layers, move, zoom and rotate them, adjust the transparency of each layer respectively and many more. It allows you to adjust the brightness, the contrast, the saturation, the hue of your photos and levels of red, green and blue. Choose from tons of marvelous filters, such as smooth, blur, mosaic, sharpen, invert (negative), binary, vignette, grayscales, sepia, vintage filters, etc. You can also paint with brushes and colors over your photos, erase the backgrounds, add fun stickers, frames, overlays, text and own many more features if you upgrade Multi Layer to its premium version. Get it today for free from Google Play!